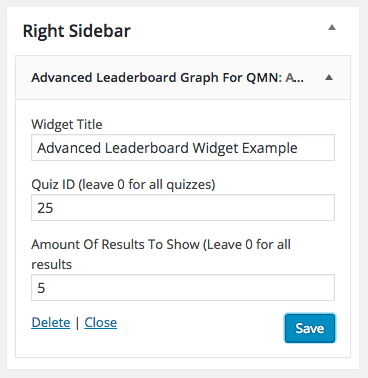 The Advanced Leaderboard addon for Quiz and Survey Master will give you 4 new leaderboard shortcodes and 2 new widgets that you can customize. You can edit how many results are listed, the name of the leaderboard, and the order the results are listed in. Once you have purchased the addon, you will have access to download the addon. To install, simply upload the addon as a normal WordPress plugin. To do so, go to the Plugins page and click Add New. Then, click Upload. From there, upload the zip file that you downloaded when downloading the addon. Once the addon has uploaded, you should now have the plugin MLW Advanced Leaderboard listed in your list of plugins. Activate that plugin. 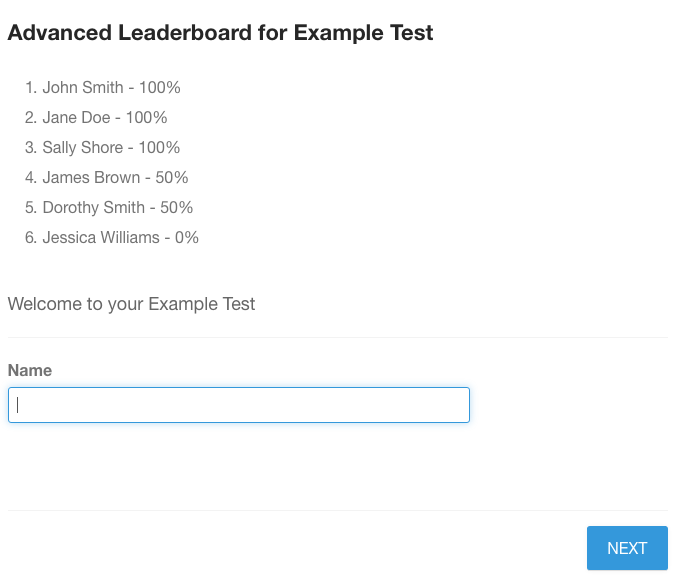 Once activated, the plugin will add an option in the Quizzes/Surveys list labeled Advanced Leaderboard. In the new Advanced Leaderboard option, you will see the Advanced Leaderboard page. This page will list the 4 new leaderboard shortcodes that you can customize along with an explanation on how to use them. To use the shortcodes, simply copy and paste them into any post or page. 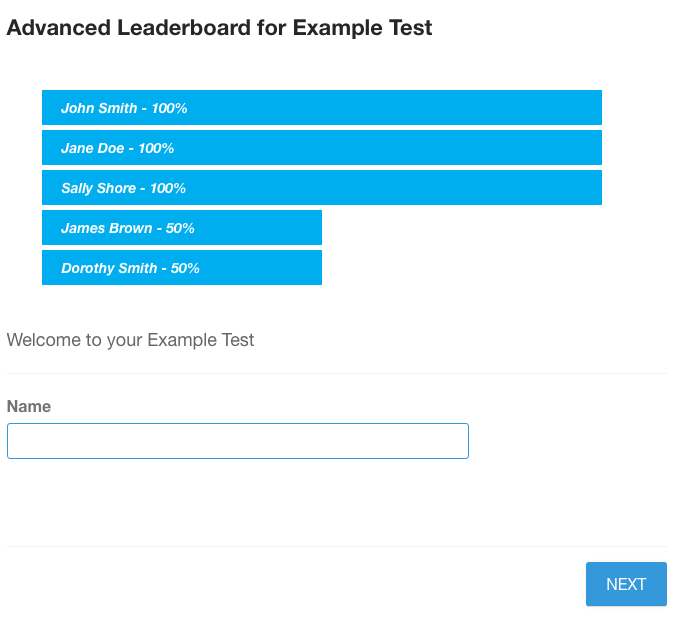 If the leaderboard is for one quiz, then replace the quiz_id value with the ID of your quiz. The ID can be found on the Quizzes page. You can replace the ranks number of 4 with the number of ranks you would like the leaderboard to display and you can replace the name Title with any title you would like the leaderboard to have. If the shortcode has an order option, you can use either 'latest' to have the leaderboard display the most recent results first or you can use 'score' to have the leaderboard display the highest score first. It is also possible to change the color of the graph. In the Graph Color option, you can replace the light blue color with any other color to match the theme of your WordPress site! The Advanced Leaderboard addon also comes with two customizable widgets. These widgets can be found in the WordPress dashboard under Appearance and then under Widgets. 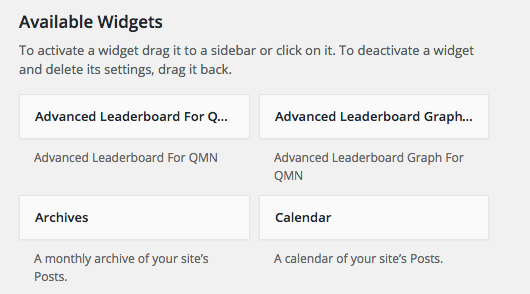 Once the Widgets page is selected, you will see two Advanced Leaderboard widgets. Select where you want these widgets to appear by clicking on them and dragging them to the labeled location on the right side of the Widgets page. Once put in the desired location, you will see a list of options you will need to fill out. The Widget Title is the title that will be displayed on the widget. The Quiz ID needs to be filled out if you want only one particular quiz's leaderboard to show. You can find the Quiz ID number on the Quizzes/Surveys main page. Also, select the number of results you would like shown on the leaderboard. Once these options are filled out and you save the widget, the widget should appear on the page. The other widget option includes a graph image, the setup is the same as the widget above.